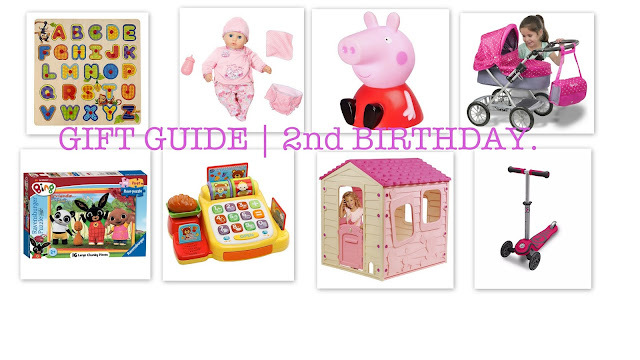 With Darcys 2nd birthday fast approaching (I just cannot believe that she will be two soon!!!) I am now starting to think about (and buy) her birthday presents. We have decided that we will be going to Peppa Pig World for the day and I have already bought her a scooter and a playhouse so I have almost basically finished. I just want to get her something to play with inside on those rainy days. So as you can see above these will be the bits and bobs I am getting Darcy for her birthday or that I know family are going to buy her. I thought this was a pretty reasonable price and Darcy is really getting in to her puzzles now and she really likes one to one activities. I must admit I enjoy doing them too..hehe. Plus she is getting something out of it.. learning! Darcy absolutely loves babies at the moment! She has one but I wanted to get her one that makes noises and is a little more interactive.. I'll probably regret that though! Ha. I've been wanting to get Darcy a nightlight ever since her transition to her 'big girl' bed. Plus she loveeeees anything Peppa Pig at the moment. These are quite good too as they're not too bright but still enough light to see where she is going. This is super cute, she'll love this to use with her baby. It's so realistic too and it has a changing bag which is cool. Like I said on the first one, Darcy is loving her puzzles at the moment and she loves Bing so i thought this would be a good puzzle to challenge her and to do as a one to one activity. I'm not sure if Darcy would be interested with this or not, but she does like having a handbag and pretending she is going shopping so I presume she would. I'm 100% I'll get her this actually, might just save it for Christmas. This one is something my mum is buying her for her birthday, I cannot wait for her to open this as I just know that she is going to love it. I've wanted to get her a playhouse for a little while now. This is on sale now at such a good price! I've already bought this and unfortunately she saw me when I bought it but I am hoping she will have forgotten! I think she will have though. She did try the one on the display and she reeeally liked it so I am excited for her to see it again and remember it. What did you buy your little ones for there 2nd birthdays?